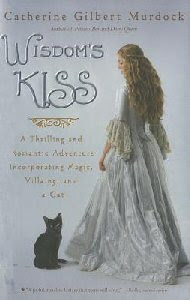 Told through various memoirs, references, and even a play, Wisdom's Kiss is the story of how Princess Wisdom, her grandmother Ben, a servant named Trudy, Trudy's long-lost love Tips, and a cat managed to thwart an attempt to usurp the power of a kingdom. A small amount of magic (shh!) plays a part as well. It all ends happily ever after. If that all sounds a bit sparse, that is because it is. Most of the events of note get retold multiple times from different perspectives and sources. This can be a useful way of revealing the story slowly, but it is far from efficient (not that this is a mark of a good story, but it explains the thinness of the plot). In the end, this story like others of this type, is more about how events are interpreted than what actually happens. While her previous foray into YA fantasy, Princess Ben was largely a by-the-numbers genre novel, Murdock has much grander ambitions in this new work. The story bounces around, jumping forward and back as the multiple narrators and media reveal events. The result, while unique and original, is difficult to follow and takes some time to get used to. Exposition and detail suffer as we skip around chapter to chapter. I admired the attempt, but the results are disappointing. Sigh . . . yeah, I felt the same disappointment. It was so disjointed, so many different points of view, that I could never really settle into the story. Sad, too, because I adored the Dairy Queen series and even enjoyed Princess Ben.